Lawyers and designers may not appear to have much in common. But they—like a lot of other people—tend to deal in billable hours, and they both need a simple and reliable means to track time spent on client projects. Jobs from Bjango, provides a simple but functional solution to that challenge. 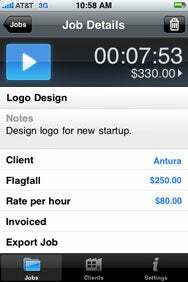 No More Missing Minutes: Jobs makes it easy to record time spent on client projects, helping ensure you get full pay. Jobs lets you track and manage both clients and jobs. Client definitions consist of only the name of a firm, but can be linked to a contact in your Address Book. Unfortunately, you can only link a Client to a single contact. If you work with more than one individual at a firm, you’ll need to create multiple entries. Selecting a client for display reveals the jobs associated with that client, and the value of work recorded. This information can be exported (via a built-in e-mail application in Jobs) which attaches summary or detail information in a variety of formats (XML, CSV, and Plain Text). You can give jobs a name, and there’s space to write notes. Hourly and flagfall rates—the latter term refers to a set initial charge at the start of a job—are based on default settings, but can be changed whenever you create a job. Tracking time is very easy—just select a job and touch the large start button. Task time is tracked until you press stop, even if the device sleeps, you run other applications, or get a call on your iPhone. For the especially industrious, it’s possible to run multiple timers at once. Each start/stop cycle results in a session record, documenting the amount of time spent on a task. Individual session records can be edited, deleted, or even added if you failed to capture a work session. You can also mark jobs as invoiced. Although Jobs performs its basic functions well, it would benefit from a few additional features. The application doesn’t provide a way to itemize expenses—a problem if you’re charging costs back to a client. And the use of a built-in mail client for data export, rather than the default Mail app on the iPhone or iPod touch, will be a problem for some users. All information is routed through Bjango servers, which offer unproven privacy and reliability. The e-mail client’s lack of integration with the Address Book means you can’t look up alternative recipients. Despite these issues, Jobs is more than likely to pay for its $4 cost by ensuring comprehensive work and billing records. Jobs is compatible with any iPhone or iPod touch running the iPhone 2.x software update.